I was checking out the Hilltown Families blog and I came across something I never expected to see. 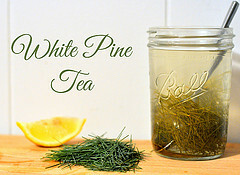 It was a recipe for White Pine Tea from Leslie Lynn Lucio. I have never heard of "pine tea," but after reading her blog post, now, I'm curious. You have to be really careful to make sure you find the right type of pine tree, which Leslie talks about in her post. But, once you find a White Pine tree, you just add some honey and lemon and you're ready to make your tea. It definitely sounds like something that would warm your body and soul on a cold winter day. Plus, it's a fun way to get your kids involved in the kitchen.